Snake oil, witchcraft, dice rolling, dart throwing, voodoo, doing nothing… are all actually not solid SEO strategies. 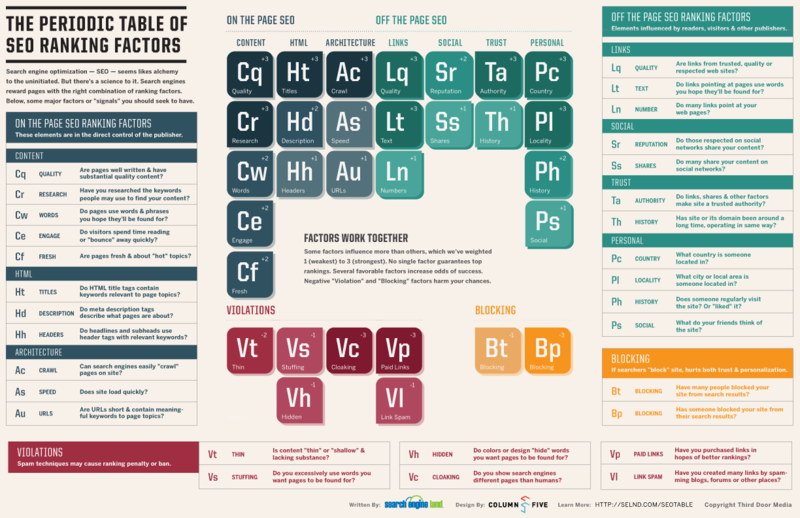 There is method to the SEO madness, as summarized by the “The Periodic Table of SEO Ranking Factors” crisp info-graphic. This info-graphic has sated my chart-hunger for now…but they forget the most important element to good SEO. Old element E2 – Effort Squared. You’ve either got to put it in yourself, or pay someone to put it in for you…good seo as you know is no mistake, and like you say: it’s not magic – but it does take effort to see results.nnKeep providing the best Boise SEO JTREE – you rock!! Amen to that! Without a solid effort, forget it! Nicely put!